I just wanted to let you all know that I do have an Aquascape Analysis prepared for this week, however it may be delayed until next week while I finish up an article on aquascaping styles. 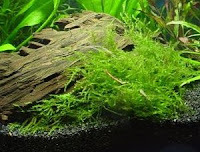 The Aquascape Analysis is based on a sanzon iwagumi style and I thought it best to explain the style in detail first before delving into analysis. I've finished a summary of the two main styles, Dutch aquascaping and Nature Aquarium aquascaping which I will be posting soon, but I just wanted to write one examining the iwagumi style. Look for these articles soon, and after them, a brand new Aquascape Analysis! Aeration - Fish only aquariums are often aerated with an airstone in a desperate attempt to keep oxygen levels high so fish can breathe. In a planted aquarium, as in nature, the live plants provide all the oxygen your fish will ever need through photosynthesis. An airstone and air pump (and all the noise and vibration that go along with them) are unnecessary in a planted aquarium. 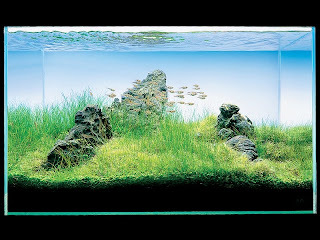 Filtration - Power filters, sponge filters, and canister filters are the only means of filtration in a fish only aquarium. It's up to these filters to remove all fish waste and waste produced by excess food. This is achieved through mechanical filtration, chemical filtration (via carbon), and biological filtration (via bacteria growing on the filter media). There are many designs of filters out there and some are better than others, but all suffer from one flaw: if not cleaned properly and regularly, their effectiveness drops. In a planted aquarium, on the other hand, only mechanical filtration is truly needed. Plants can handle chemical and biological filtration fairly well. They absorb chemicals that are harmful to fish (in fact they live off of the chemicals produced by fish waste) and provide a perfect medium for beneficial bacteria to grow on. Of course, plants have their limits of filtration as well and most planted aquariums have a back up filter providing mechanical and biological filtration. 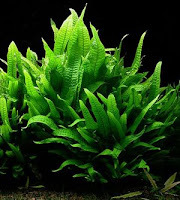 Chemical filtration in the form of carbon will remove beneficial compounds and fertilizers needed by plants, and is not advised for a planted aquarium. Protection - In fish only aquariums, the focus is the fish themselves, and their environment can be somewhat neglected. Not having enough protection can cause fish to be stressed and more succeptable to disease. 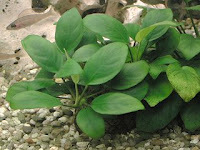 Although artifical decorations and plants can be bought and put in the aquarium to provide protection and cover for fish, they are inferior to real plants in many ways. First, they provide none of the benefits listed so far aside from a location for beneficial bacteria to colonize. Second, they are much more likely to injure fish. Live plants aren't hard and don't have sharp edges like plastic plants can. Food Source - The only source of food in a fish only aquarium is the owner of the aquarium (aside from algae for algae eaters). That means the fish are entirely dependent on you and the food you give them. If you don't make wise choices and vary their diet, they may not be as healthy and can become more succeptable to disease. Also, if you forget to feed them, they have no alternative food sources. In a planted aquarium, the fish have a choice. Although not all fish will eat plants, most will pick at the leaves and dead or dying plant matter if no other food is available. It also helps to vary their diet. Many fish are omnivorous and need to eat plant material. 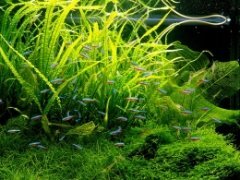 Algae Prevention - Algae is often a problem in fish only aquariums, and although keeping algae eaters and scraping the glass with an algae scraper are ways of combatting some algae, other types of algae are more stubborn. Algae occurs because there are nutrients in the water and there is light (even low light). 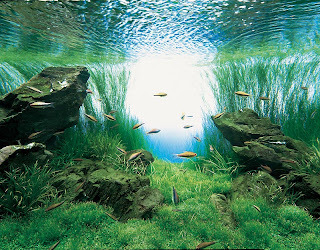 In a planted aquarium, plants can outcompete algae and use up all of the nutrients in the water. Although this can open up a whole other can of worms while you try to get your light levels and nutrient levels right, once you get your planted aquarium balanced, you will most likely never have to clean the glass or pull algae off the gravel again. And there you have it. These are only the practical benefits I can think of, there are many many more benefits to owning a planted aquarium, and it's easier than you may think. Even just a few floating plants can make a serious impact in the health of your fish and the tank as a whole. So what are you waiting for? Throw out that noisy air pump and dirty airstone, toss the neon pink plastic plants and cheesy castle decoration, and take the plunge into a planted aquarium. Your fish will thank you! 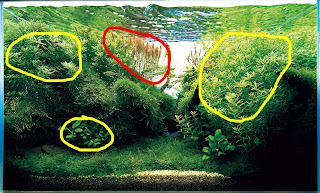 Aquascape Analysis #4: Filipe Alves Oliveira's "Across the River"
This week's Aquascape Analysis is not an Amano aquarium, but that of Filipe Oliveira. This aquarium, "Across the River" won him the 2006 International Aquascaping Contest promoted by the Aquatic Gardner's Association, so it's no small surprise that it's being featured here! 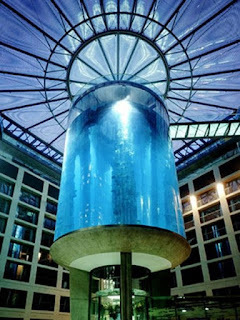 First, it's easily apparent that the profile of this aquarium is that of a mound, or an inverted "V." This creates attention near the center of the aquarium, which is desired for obvious reasons; in this case it is to bring the viewer in towards the focal point and the mysterious darkness right in the middle of the aquarium. The focal point of this aquarium is the Ludwigia inclinata var. verticillata "Cuba" and more specifically, a section to the right of the center (circled in red). This section is un-obscured by driftwood and is the brightest section in the photograph. Note the use of hardscape to "frame" the focal point to eliminate the creation of too many or too large a focal point. There is also a secondary focal point to the left in the Ludwigia "Cuba" as well. The cove in the middle of the aquarium isn't really a focal point because of its darkness, but it is certainly a point of interest and the dark, somewhat obscured "river" of sand lined by rocks creates incredible amounts of mystery and hence, fascinates the viewer. 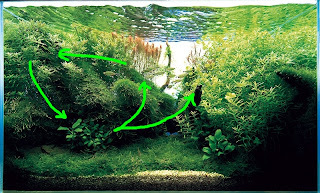 The flow of this aquascape is much different from a traditional Amano aquarium in that it does not radiate out from the focal point, but instead brings the viewer's gaze across the Ludwigia "Cuba" and down the driftwood into the Blyxa japonica and also down into the mysterious cove created in the center of the aquarium. This aquascape shows a viable alternative to Amano's radiating flow direction, although the flow here is much more subtle as the aquascape is much less "busy" than Amano's, requiring a much more gentle guidance of the viewer's gaze. Too harsh a flow and the aquascape may look manufactured. Finally, we can see the foreground (green), midground (blue), and background (yellow). The G. elatinoides makes up the entire foreground, keeping it simple and not drawing attention. The midground consists primarily of the four large Blyxa japonica plants. These plants also serve to block the viewer's gaze of the base of the Ludwigia "Cuba" which like most stem plants, is often less attractive near the base. The Ludiwigia "Cuba" makes up the entire background, bursting with color and texture. Overall, the major takeaways from this aquascape are that with a simpler scape, you don't need as much influence on the flow to get the viewer's gaze around the aquarium and that major points of interest need not be the focal point. Here, the cove is intensely interesting to the viewer as it is dark and hard to see where it leads, but it is also sheltered, appealing to our primitive instincts. The textures used in this aquascape also complement each other; the long deep green diagonal leaves of the Blyxa japonica contrast nicely with the bright, reddish whorls of the Ludwigia "Cuba." It's not hard to see that Filipe Oliveira has created a masterpiece out of just three types of plants and a very intriguing cove. Aquascape Analysis #3: Amano's "Dance of the Angels"
For this week's Aquascape Analysis, I've decided to analyze Takashi Amano's aquarium "Dance of the Angels" from his book Nature Aquarium World Book 3. 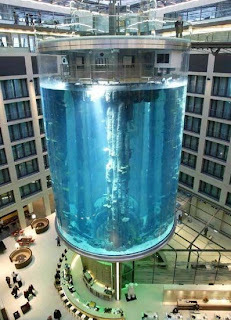 This is a very large aquarium (2590L or 673 Gallons!) that is designed to be viewed from both sides. I wasn't able to find a picture of the other side of the aquarium, so just understand that this is a particularly wide aquarium and has an entire other aquascape on the other side. The advantage of having such as large aquarium is you can use larger plants like Cyperus helferi and let them grow to full size. This aquascape can be imitated in a smaller aquarium though, simply by substituting larger plants like the C. helferi with smaller plants, like Blyxa japonica or Echinodorus tenellus. First, we can see that the profile is partly obscured by the top of the photograph (or aquarium) but it has overall a sloping profile, meaning it starts lower on one side of the aquarium and slopes upwards to the opposite side. The viewer's gaze will be automatically drawn down this slope, and it also prevents a "wall of plants" effect. 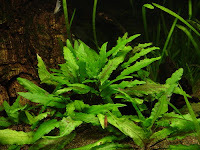 There is a slight "V" effect in the profile as well that helps to draw the viewer's attention towards the back of the aquarium between the C. helferi and Java Fern plants. The focal point is somewhat hard to distinguish because of the angel fish, which obviously draw the viewer's gaze first. However, in real life, the fish wouldn't stay stationary and although they form the focal point in this photograph, the overall focal point of the aquascape is the central C. helferi plant. There are also several secondary focal points around the aquarium as well, including the C. helferi plant on the right side, the bright spot in the background, the highlighted Glossostigma elatinoides in the foreground, and of course, the fish. Amano has cleverly placed the secondary focal points to draw the viewer's gaze around the aquarium without using obvious driftwood or rocks. If we look at the flow of this aquascape, it is largely determined by the secondary focal points. These have been purposely placed (or patiently waited for in regard to the fish!) strategically around the aquarium. 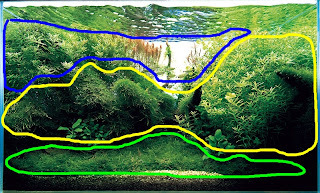 Finally, if we look at the composition of the aquascape we can see that the foreground (red) is comprised of the G. elatinoides, while the midground (yellow) is made up of two islands of C. helferi and Java fern on the right side of the aquarium. The background (green) takes up almost the entire top left corner. This composition almost pushes the viewer to the right side of the aquarium and up the G. elatinoides carpeted pathway between the gently swaying C. helferi leaves and deeper into this beautiful aquascape.